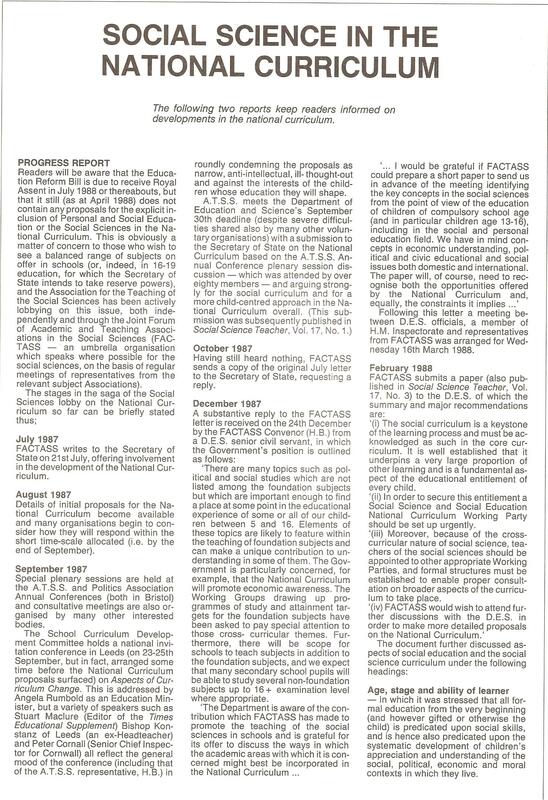 Can it really be almost a quarter-century since Kenneth Baker made this pronouncement? 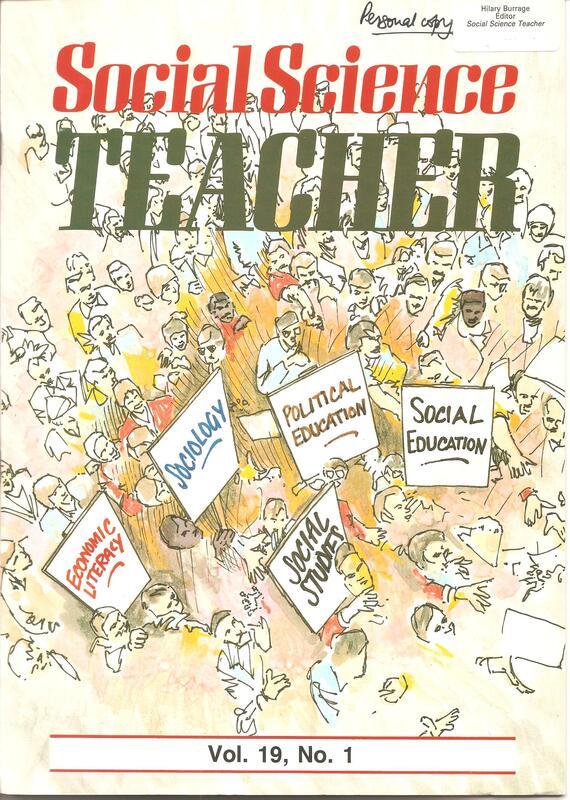 The campaign to embed Personal, Social and Health Education (PSHE) in the UK school curriculum has been a long haul; by no means all politicians with their hand on the Education rudder have been as sensible as was Ken Baker in 1990. 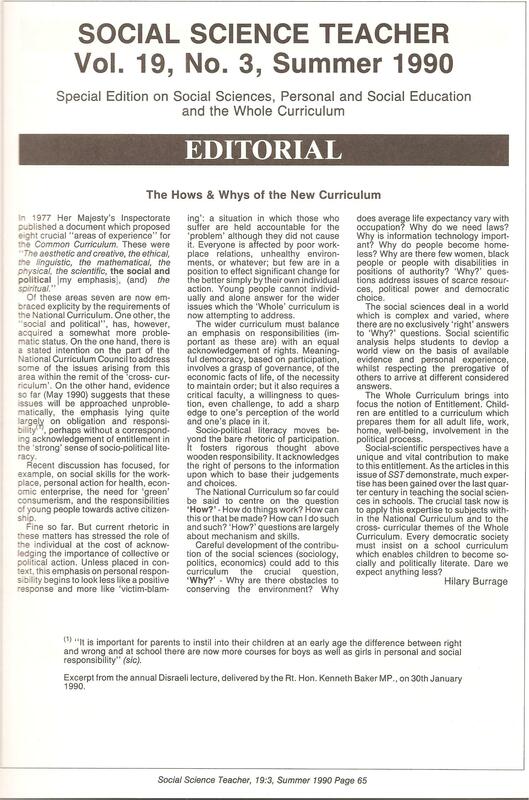 Some indeed have made every possible effort to enforce a curriculum now generally thought more suited to a century earlier. 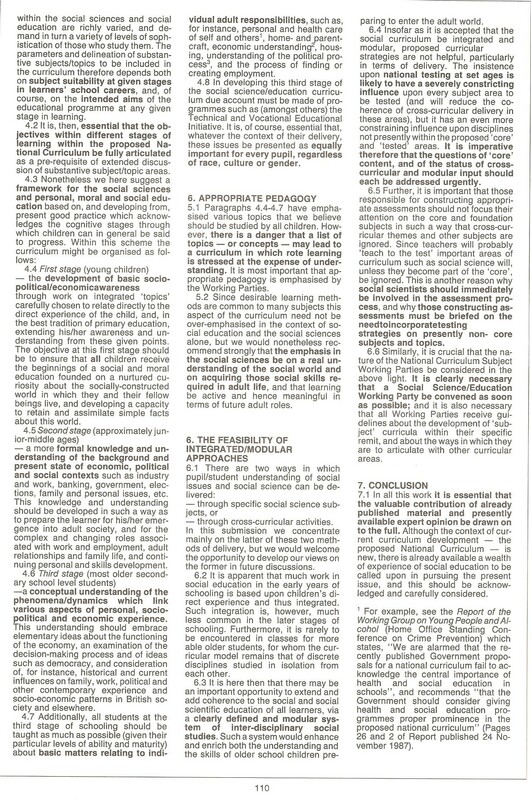 What follows here are some examples (material written by me, or with me as the lead author, for the journal Social Science Teacher) of how the debate was shaping up a quarter century ago, around the 1980s and early ’90s – material perhaps of interest to those who are now (2013) faced with very similar curricular challenges? 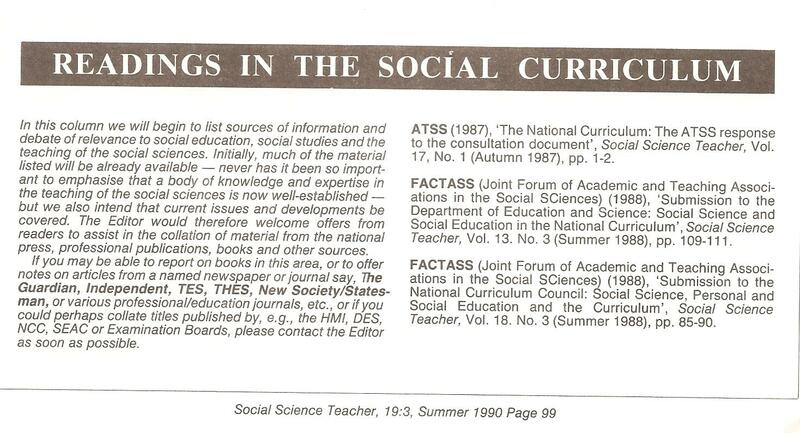 Back in the 1980s, just as the debate about the proposed UK National Curriculum began to engage everyone in education, I became National Secretary of the Association for the Teaching of the Social Sciences (ATSS), and then Editor of the ATSS journal, Social Science Teacher. 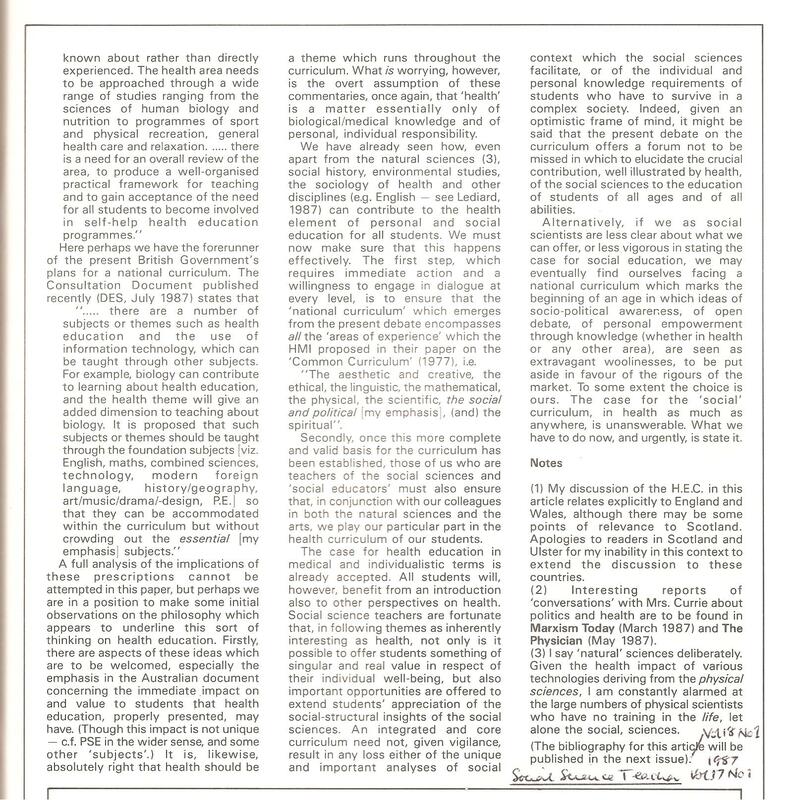 In these capacities I found myself at the forefront of efforts to ensure all children (everyone, in fact) had entitlement to sound and appropriate knowledge about how their own bodies, and the society in which they lived, actually work. Such an entitlement might seem very obvious to most of us, but it was apparently far less persuasive for some (especially Conservative) politicians then in power, and to various others such as the parent-lobbyist Victoria Gillick. 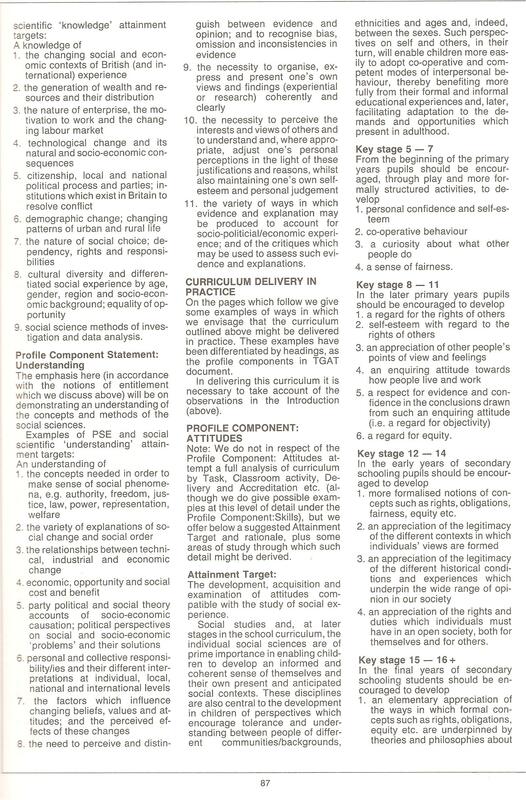 Whilst most teachers and probably most parents were keen that PSHE should be part of the then-new National Curriculum, this position was by no means unanimous. 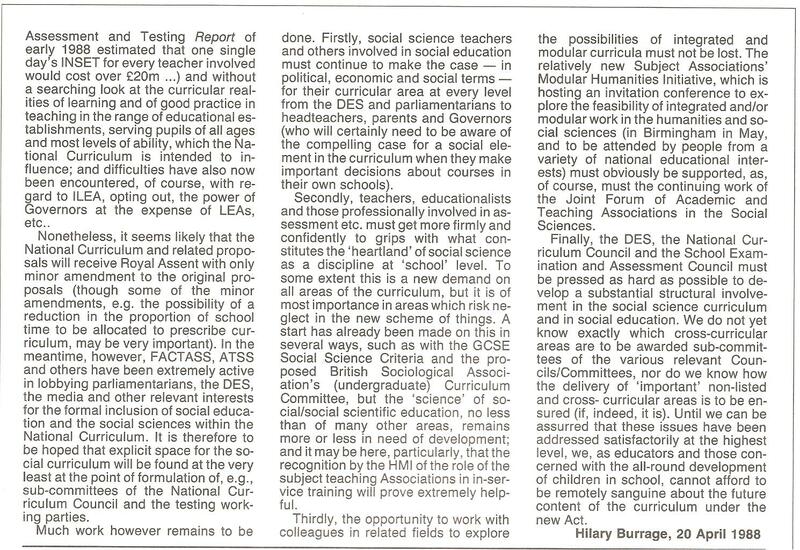 My own response to all this was two-fold: Firstly, I worked with colleagues to devise FACTASS – the Forum of Academic and Teaching Associations in the Social Sciences; and then I wrote a chapter on ‘Health Education’ for the reader, The New Social Curriculum: A Guide to Cross-Curricular Issues For Teachers, Parents & Governors, edited by Barry Dufour (Cambridge University Press, 1990). 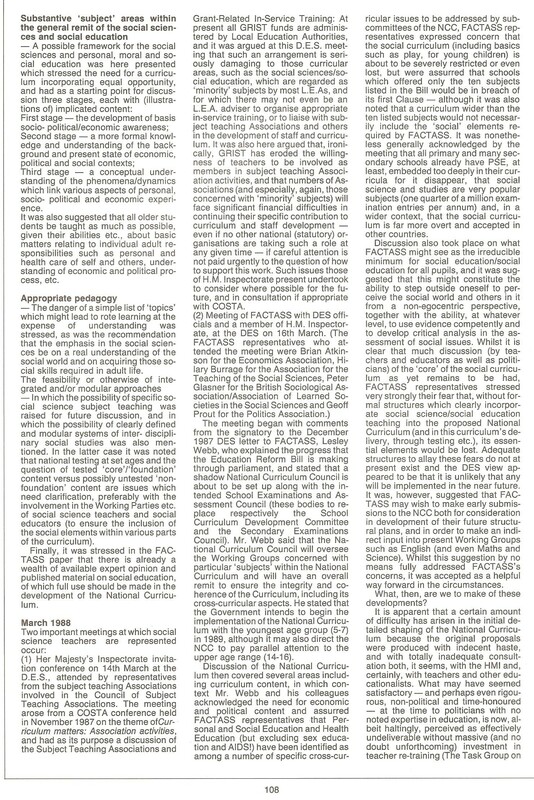 Deliberate intent to deny young people a working knowledge of their bodies and communities is in my view culpably wrong. It is not however necessary to rehearse all these arguments anew…. 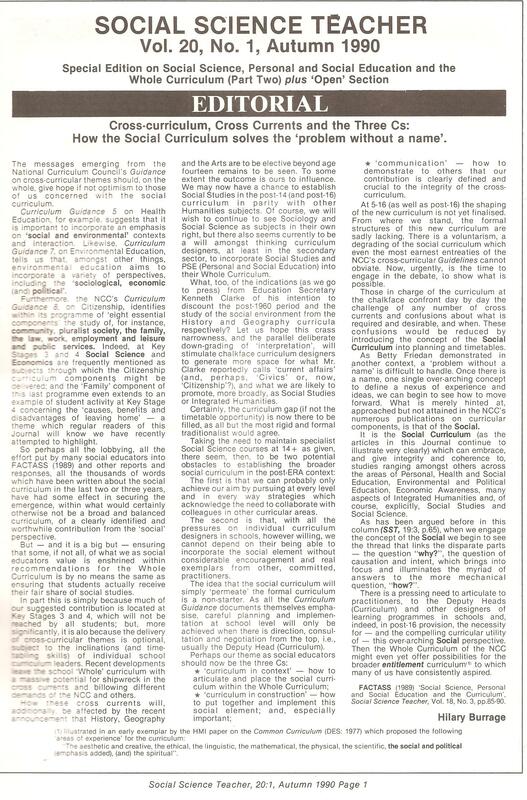 I have decided instead to reprint below the debate as it was originally conducted in the later 1980s and immediately thereafter. 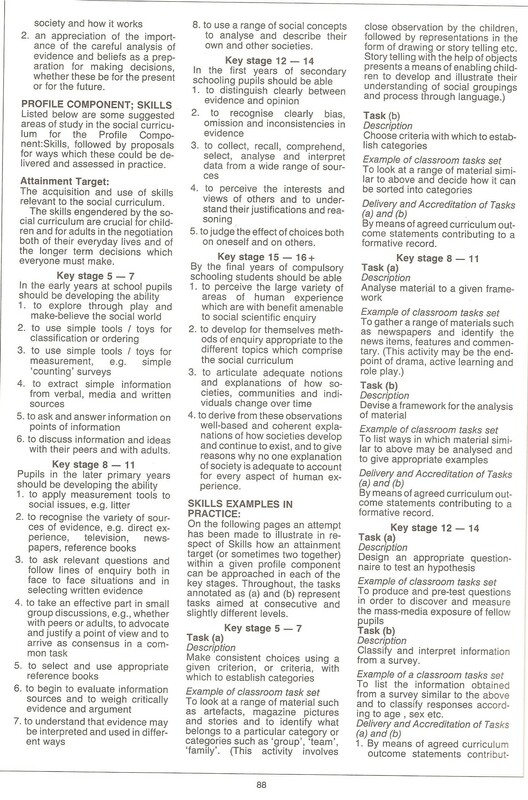 Our knowledge of how to help children and young people to learn about themselves has made big strides since the testing times in which FACTASS first emerged, but apparently we have yet to secure their right to that essential information. 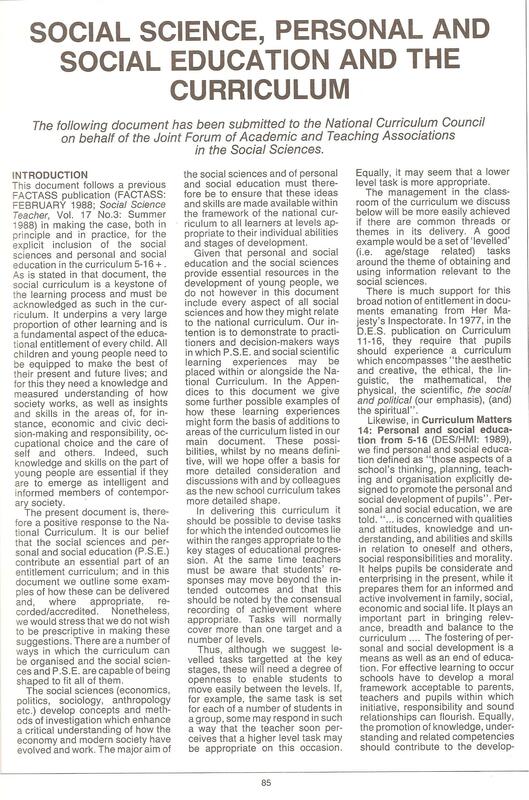 I hope the documents below (all of which I wrote and/or for which I was the editor) will give a flavour of the way the debate about Social Science / Personal, Health and Social Education and, a little thereafter, Citizenship Education, developed during the late 1980s and early 1990s. 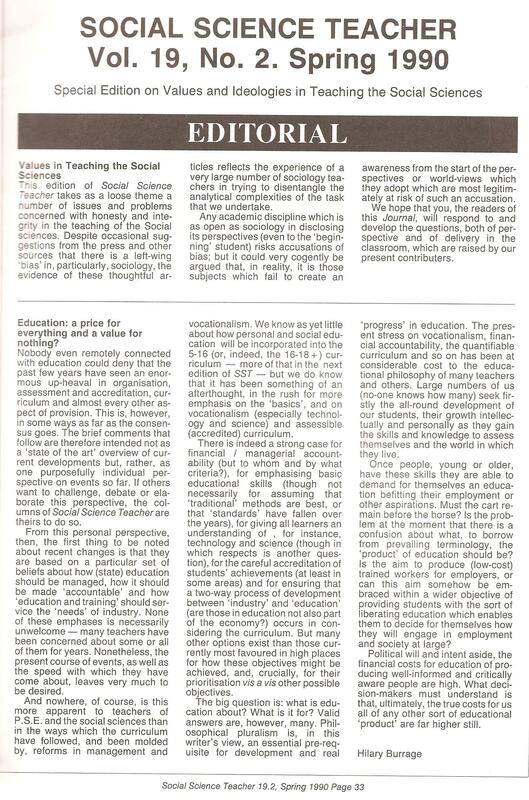 Education: a price for everything and a value for nothing? 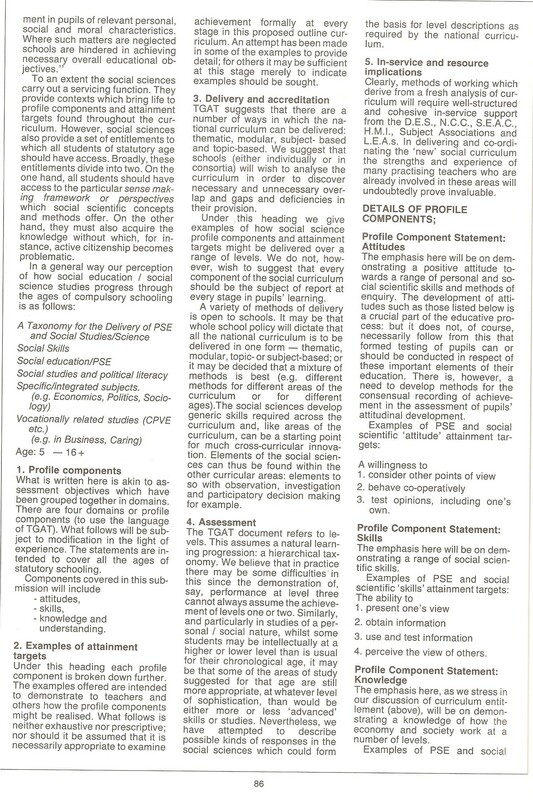 Personal Autonomy, Personal Effectiveness or Social Empowerment? What can education offer young people? 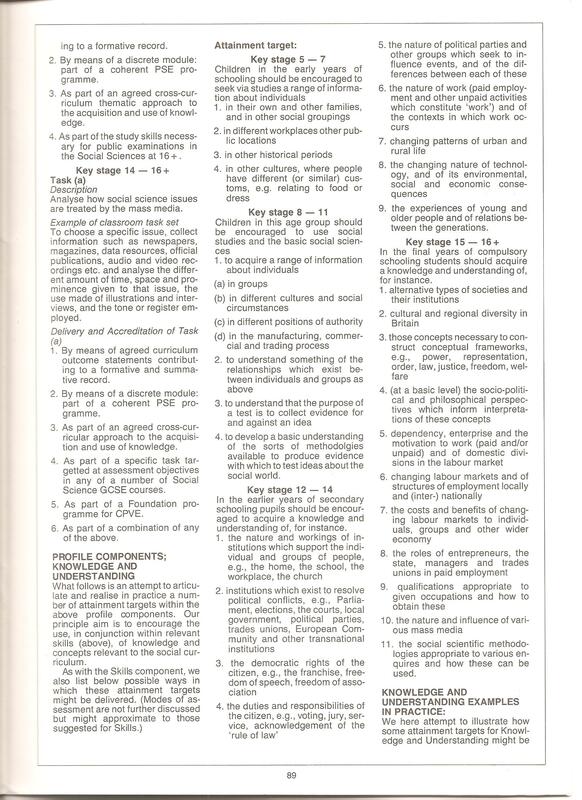 * If your organisation is not listed here, and you think it should be, please be sure to say so. Thank you. 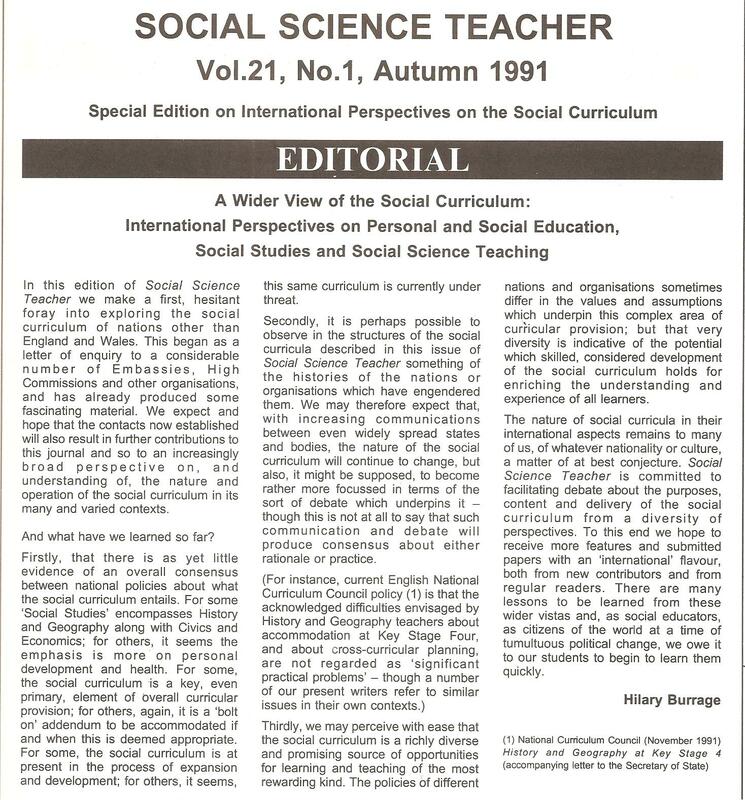 Hilary a long journey indeed as your call for inclusion from international perspectives on personal and social education in 1991, only now the NSPCC survey indicates an urgency for teachers awareness and knowledge on FGM for safeguarding. A lutua continua! Extraordinary how much push it takes even to achieve patently obvious / critical change.